We were driving along Hwy 20/Oakes Avenue out of Anacortes, Washington towards the ferries that run out to the San Juan Islands, when I saw something out the passenger window that I couldn’t process. “Go back” I exclaimed. 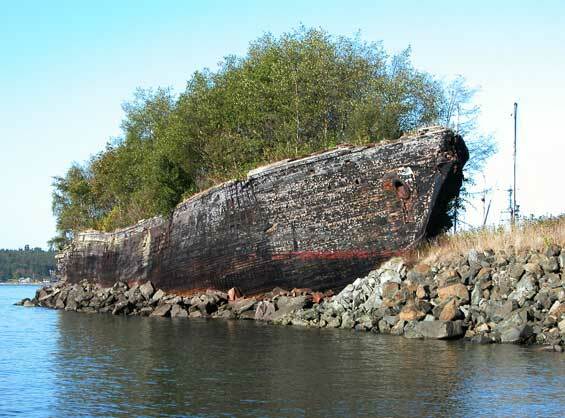 “What for?” was Johns reply….”I am not sure but it looks like a forest growing out of an old wooden ship”. So John maneuvered down the steep, narrow, gated drive to a small parking lot below. We were surrounded with an old marina, a working boatyard, crumbling plank board industrial buildings and rusting antique machinery buried in tall grass. In front of us though, like the elephant in the room was a massive wooden ship run aground and growing a forest off its upper deck. A picture is worth a 1000 words so here you go. We didn’t want to overstep our stay, so we called down to a few guys working on boats on the docks. “Do you care if we come take pictures of the old ship?” “Come on down.” was the encouraging response. We joked around and talked about their boats, all really unique in their own right. 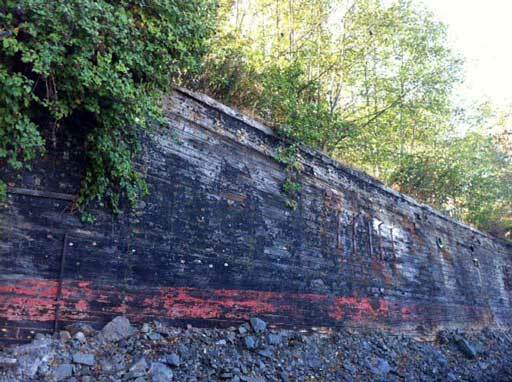 We wanted to learn the story behind this massive relic, so we got talking to Kelly, a boat owner. Everyone we met on the docks were really personable and seemed genuinely fond of their little marina. So the story we were told is that Louvric, a Croatian immigrant came to Anacortes in the 1960s. He wanted to create his American Dream and so planned to repair boats for a business. From the folks on the dock, there were numerous accounts of the history of the boat. One account was “a mother ship for the Flounder fleet” another version was “that originally it was a commercial sailing vessel with cargo” and lastly “that it had been purchased as a floating hotel by Louvric, who then could not secure permits”. So with a little digging we learn more through the records at the Anacortes Museum. 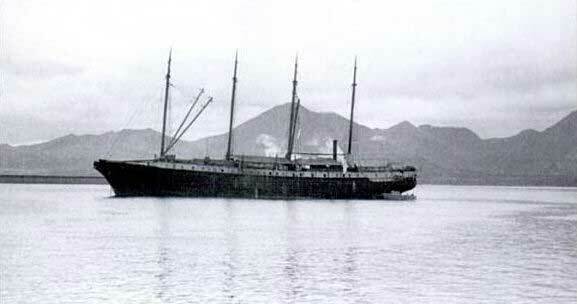 The ship is “La Merced”, built in Southern California in 1917 for use in the petroleum industry by Standard Oil. She was sold several times but had a rich history of international trade from the west coast through the South Pacific all the way to Australia. 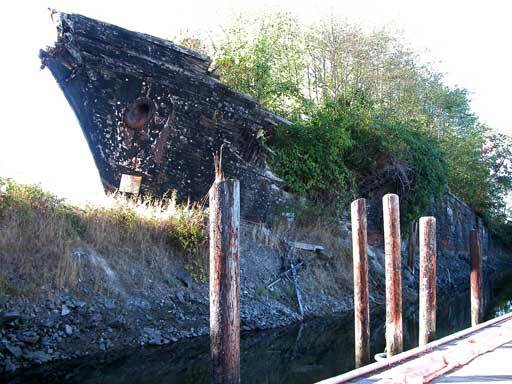 She later served as a cannery ship in Alaska before being decommissioned and sold to Louvric. 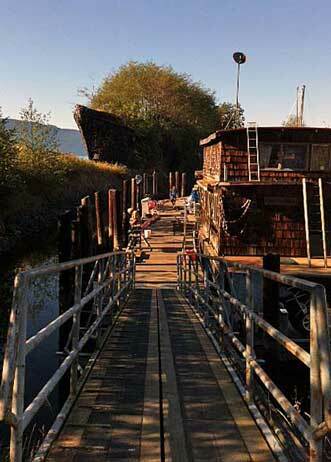 He towed her to her current location to create a seawall for his fledgling marina. 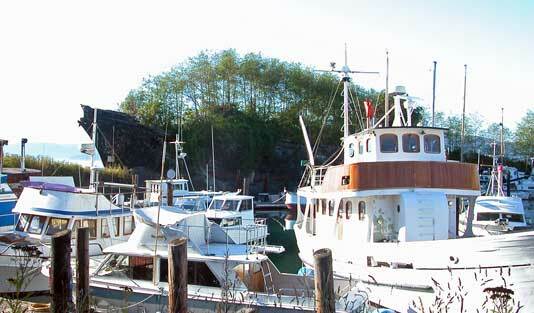 He dredged the marina area out, put the dirt around and in her hull. Over the years trees took root and became the forest that now inhabits her. A truly remarkable feat for a businessman to have taken on, but in the end, he had a monumental seawall and a protected anchorage for the marina and shipyard. Louvric used his wits, resources and ingenuity to create a very unique and special landmark in the fulfillment of his American Dream. Imagination was the mother of invention. Thank you Nancy. I hope you and your Dad find La Merced as special and entertaining as we did. Wishing your Dad the best of health in his continuing adventures! Louvrics imagination seemed to have no bounds. It was such an amazing functional creation that is still working today. Glad you enjoyed it guys. What a find! It shows it pays to keep your eyes open, you just never know what’s around the corner. It is really a site to behold. You would enjoy it :-). So glad you enjoyed it Lisa. I think we need something from you and crazy Antonio about P.V.! I love that you saw this, Suzanne. And I love that John was willing to go along with the adventure you were sniffing out! Great teamwork. 🙂 What a treat all around! Thank you! Damon, your voice is another voice that Itchy Nomads like Quirky, Weird and Unusual things. I think we will all have to keep our eyes open for things to share that are novel. So glad you enjoyed it. Thank you Treehouse Guru :-). So glad you enjoyed it Fran! Would love to hear about some of your little discoveries as you travel, so please share. Congratulations on mastering the U-Turn, that’s a real achievement in an RV with a tow car.